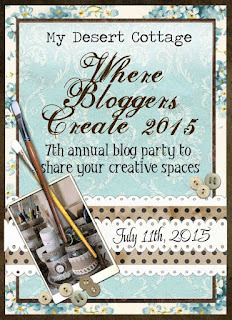 Hello my bloggy friends and welcome to this years Where Bloggers Create party!! I hope you all have a wonderful time browsing the beautiful, quirky, or just plain awesome studio spaces that our party goers are sharing this year! This is the view when you first walk into the space. I found that rolling cart at a garage sale for $5.00. I painted the butcher block top white and I love it now. It is always there when I need an extra table during a project. A shoe cubby works great atop the dresser to hold trims and laces. The dress form was an amazing Craig's List find. I drove two and a half hours up north to pick her up. How could I resist? She was only $75.00!!!! I keep all my glitters in and on this cabinet. I especially like all little salt and pepper shakers to hold my favorites. The bookcase behind my desk is overflowing with fabric. Sometimes it's hard to keep it neat and organized cause I just keep shoving more in there! 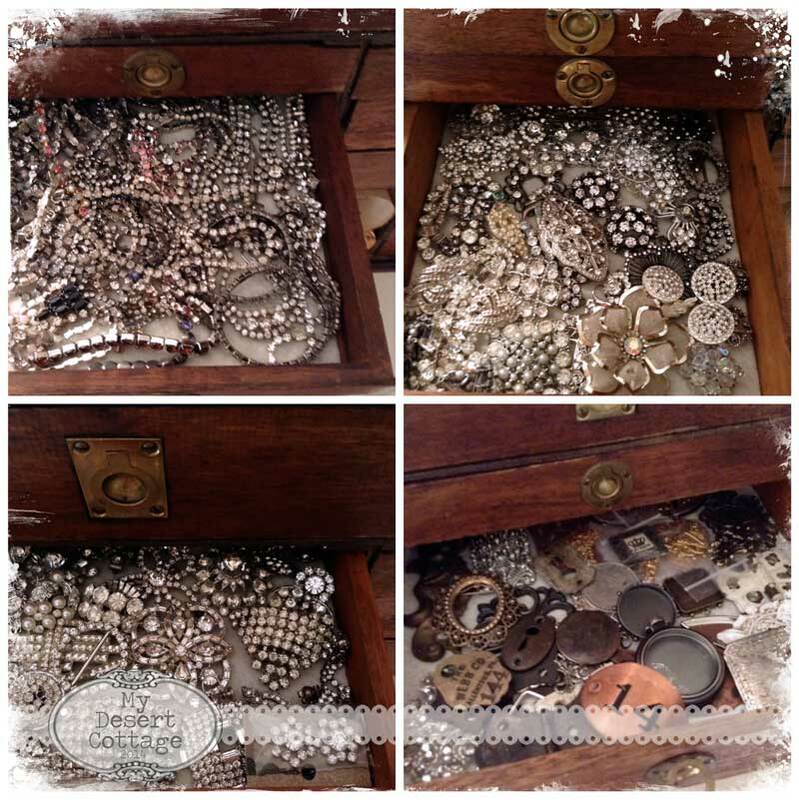 The cabinet to the right is full of jewelry supplies like beads and wire, but the wooden drawers on top hold hold all my bling!!! See that cutie on the left?? The card catalog was a Round Top find. I painted it Duck Egg blue and distressed it. I have a confession to make. I originally put in my shop to sell. I was so bummed out after putting it in there, I went right back to the shop the next day and put a sold tag on it!!! I couldnt let it go!!! Seriously, it was meant to be mine because on my way home from picking it up, I stopped at Goodwill and found 2 more shoe cubbies to paint and put on top of it!!! It took the place of my TV which I rarely watch anymore. I have become addicted to audiobooks!! The cubbies are filled with authentic vintage lace that I have been collecting for years. When I first started collecting it I was hoarding it like there was no tomorrow! I couldnt bring myself to use any of! Now I feel a little more comfortable using it (sparingly) LOL!!! As you can see, I like to have most of my supplies out where I can see them. I forget I have things if they are too hard to find. I also like how everything looks when it's displayed. Unfortunately sometimes you have to go for function over form as with this light fixture. I have to say though... it is the most wonderful light I have ever had! The magnifier is a godsend to these 50+ year old eyes!! I use these cubbies to hold the crinkled (and sometimes dyed) seam binding I make. I love the way it looks. Yards of lace hang where I can see them too. It's a simple thing, but it makes me happy to look at it! I also love the door pocket organizer that holds different kinds of ephemera and doo dads! Well, I tried to keep this post short and sweet so you guys could get to the rest of the party goers!! Have fun and don't drink too much!!! Gorgeous as always, Karen. I had no idea those cubbies were called SHOE cubbies. I really must find one. They look so handy. I have to agree that sometimes function must take the place of beauty, as I found out when I was trying to decorate my craft space. Thanks so much for hosting again. This is always so much fun, and even though I missed last year, I really, really like the linky link up. I think it's a big improvement. Hi Karen... This is one of my favorite days to look at all the blogs! All the bloggers are so creative and their studios are awesome! Can't wait to see more! Oh Karen...not sure if you have noticed already but on your post title you type 2105 and I think you meant to type 2015 :-) No biggy, we know what you meant, hee, hee, hee. Karen, I look forward to your party every year since first discovering it 3 years ago. Your space always has me in awe! Love the new rolling cart and the card catalog is to die for! I have a couple of vintage pieces that I have been toying with painting and I think you've won me over. lol! 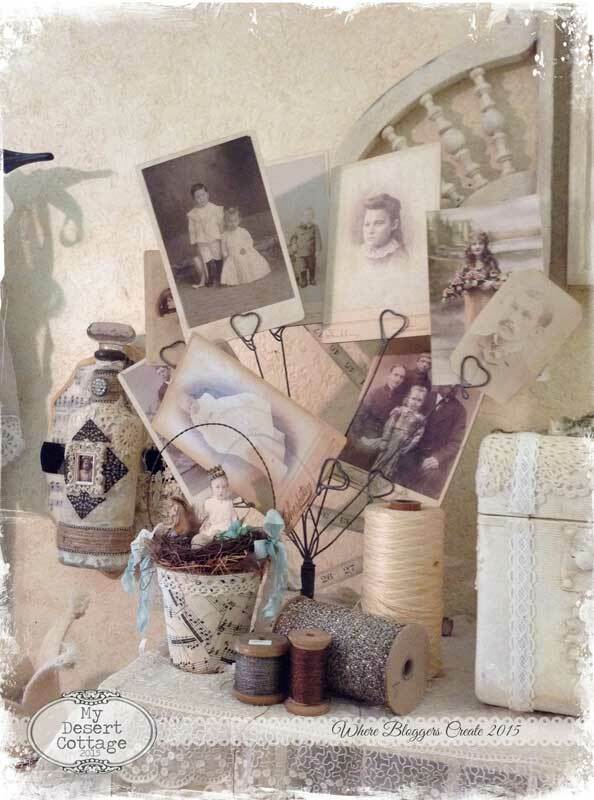 I love all of your vintage laces. I pick them up whenever I find them, but nothing like yours! I keep them in my sewing room and I do use them, but must admit that sometimes it is hard. Love your use of the shoe cubbies. Your entire room is just full of eye candy! Thanks so much for this wonderful party! Thanks so much for hosting. 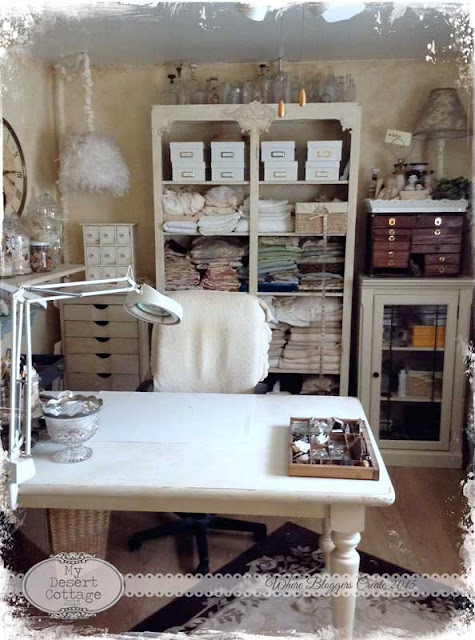 Where Bloggers Create always motivates me to clean up my creative spaces. Your studio space is just beautiful! 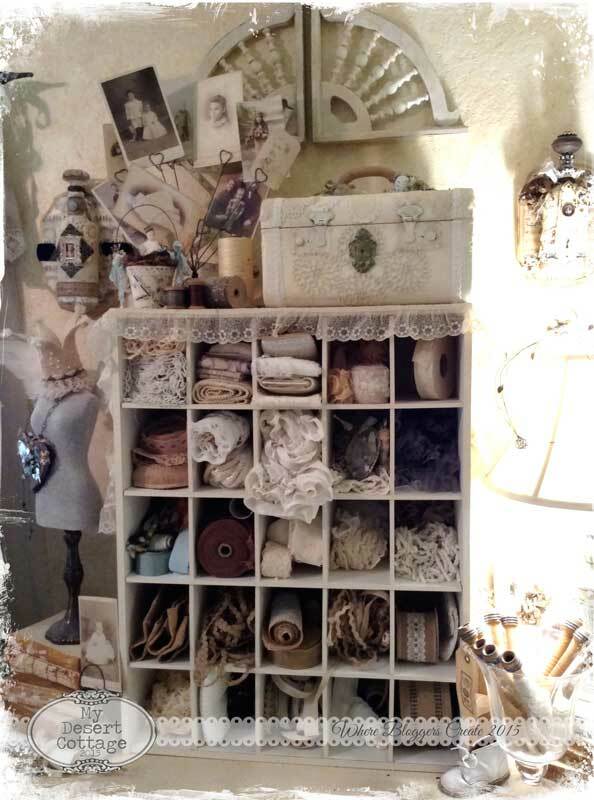 It's funny, I used everything in the world to store my collection of vintage lace, but never thought of a shoe cubby! That's a great idea. Thanks so much for hosting this, I was happy to get to participate for the first time in a few years! Thank you for hosting and posting this wonderful event each summer. I really look forward to seeing everyone's studios and ideas each year. Your space is amazing ! I appreciate your ongoing inspiration through your blog and sharing of your ideas. Thank you again !! How exciting to be joining up again at Where Bloggers Create. I look forward to visiting all the lovely creative spaces shared this year. Thanks for hosting this event Karen. As always, your creative space is totally adorable. You have such a lovely space. I like everything you do! and how it is so harmonious in all the whites !! It's my second time and I love to see all of the other studio's. My daughter and I have been so looking forward to Where Bloggers Create. It is my third year, but Gaia's (www.O-Deer.com) first, so it is very exciting for her. Love to show off, and can't wait to start peaking into other studios and craft rooms. As always, your space is simply awesome. I am inspired and overwhelmed, and could never keep mine looking so elegant. I am afraid the function over form, and chaos over organization always win around here. That said, I love my space too. My husband came in a few days ago while I was shooting pictures and told me it was "unnatural". He is used to my extended mess. Thanks so much for having this again. it is one of the highlights of my year, and a reason to clean and organize. Hi Karen! Oh, your studio is gorgeous! Love seeing how you place all of your goods! I so enjoy Where Bloggers Create each year and was hoping I could join you. I have a 'room' now to sew and craft but didn't get it done for this years party. Maybe next year. Hi Karen! This is my first time joining this party! Carol from Art & Sand encouraged me to do so, and here I am! Thank you so much for hosting and have a blessed and lovely weekend! I just love your space, Karen, and I enjoy this party when I get to see a little bit more of it. : ) I am envious of the light you get in here as well as the size of it. I always think that if I had a little more space . . . but then I suppose I'd always be wanting "a little bit more". 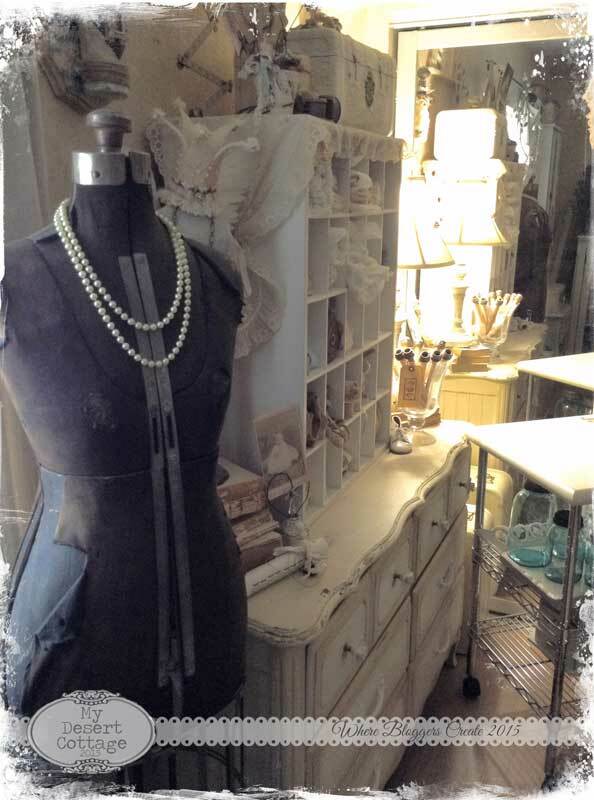 Love your mannequin - it was a great find. Your shoe cubbies are such a great idea to keep things organized yet where you can see them. I am like you, if I don't see it I forget I have it! Love so many of your ideas here. I am sure my craft room Pinterest board is going to be on overload this weekend! Hi Karen, What fun to join in this year after having to miss last year's party. 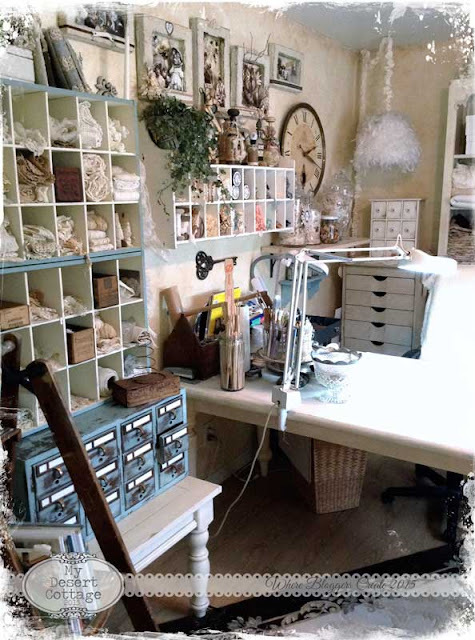 Your creative space is amazing and I love touring around in it seeing all your pretties to design with. 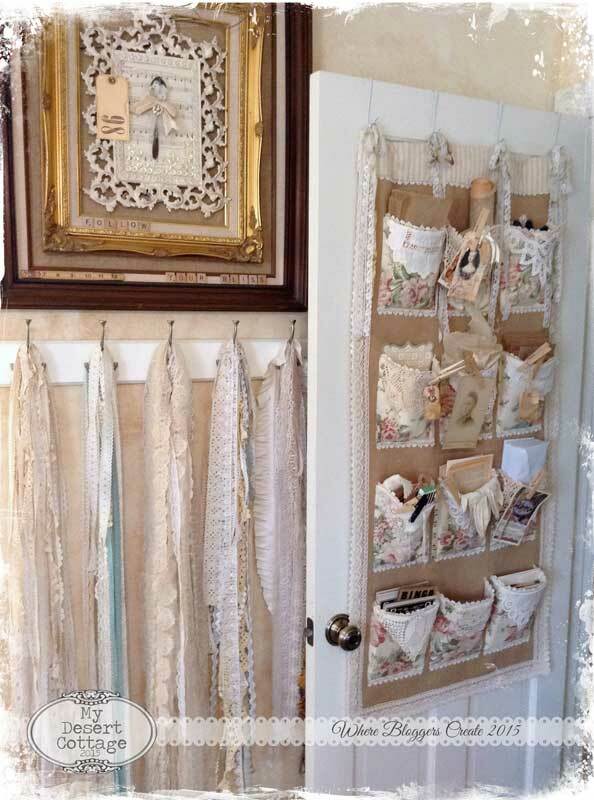 Each detail is gorgeous and the displays so charming. Just love it and thank you for hosting again this year and giving us all the chance to share our love of creating in our special spaces. Have a great party and be blessed. I can't wait to go through and see all the inspiration that this party has to offer! I worked hard and re-arranged and re-organized my space this year because i go part time in 2 weeks and plan on spending a lot more time in my craft room than o have in the past!! Love your beautiful space and thanks so much for hosting this wonderful party!!! I've always loved your studio Karen, it's so feminine and just looking isn't enough - I'd really like to examine with my hands your bling and feel the lace and fabrics. Whether bloggers participate in your party or just want to visit for ideas, it's inspiring to see how others have thrifted or repurposed for their creative space. 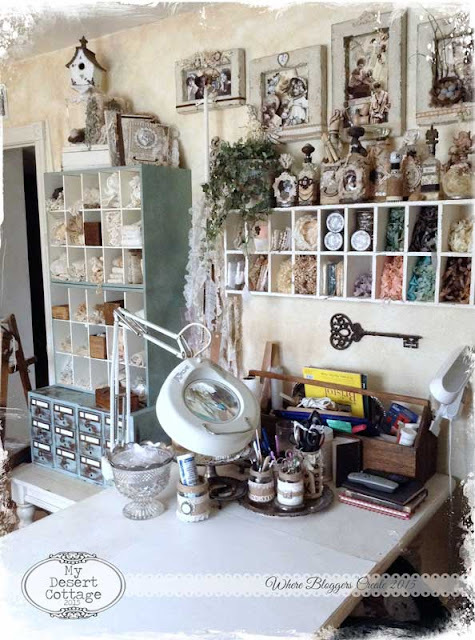 Oh Karen, I have been in your gorgeous studio and can remember how magical your space is. You inspired me to keep my studio organized. Girl, I have no internet and had to join this party via phone but I did it!! I'm visiting my family in Illinois and a storm knocked out their internet, sigh. Where there is a will, there is a way. Thank you so much, Karen, for hosting. I'm just thrilled to be joining all this talent for the first time. Cannot wait to go snooping! Karen, so happy to participate for the fourth year in a row! Firstly, your room, as always, is amazing. You are so inspiring to me and I just love your beautiful style. Every inch is a work of art. I have missed my bloggy friends and look forward to visiting everyone again; I have been so busy knitting and podcasting, I need to reconnect - and what better way than to take some wonderful tours! Thank you for hosting this awesome party once more - I do appreciate all the incredibly hard work and organization you do for all of us. Have a wonderful time at the party! Your studio is gorgeous! 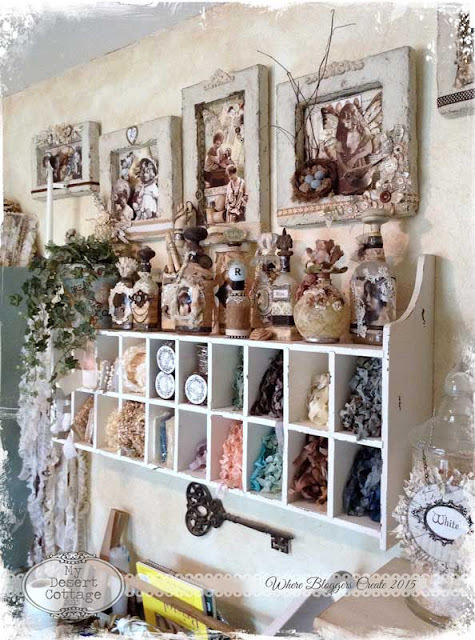 I enjoyed seeing your many beautiful and creative display and organizational ideas! This is my first time at the party. Thank you for hosting it. Hi Karen, thank you so much for hosting this fabulous event. Your studio is incredible, always a eye candy to look at. Can't wait to see all the other creative spaces, it's always an inspiration to take a peek in other peoples beautiful rooms. I always enjoy looking at your space, Karen. I'm so pulled in by how romantic and serene your room is. I would love to just sit there and there come up with new creative ideas! Love all of your wonderful laces and bling! Thank you for hosting this wonderful party again this year! Karen, another fabulous studio tour. 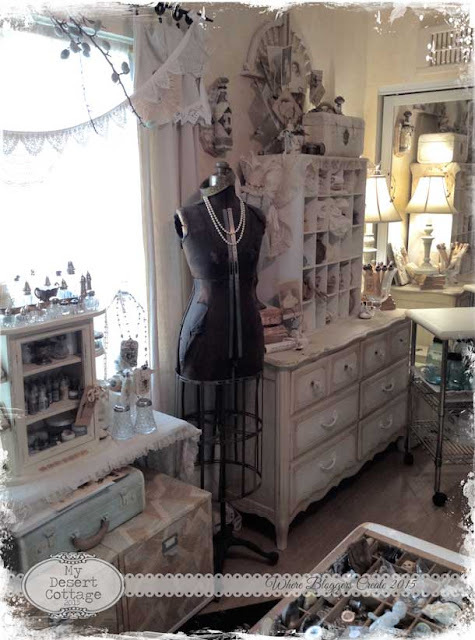 Just love your beautiful creative space! Thanks for sharing your studio and hosting! You have such a gorgeous space! I love your style. Thank you so such for putting together this blog party. I'm excited to share my space and check out everyone else's space as well! A little preview of Heaven!!! Absolutely loving the tour!! Thanks for hosting it again...xox Loved the changes in your studio. and I think it was a great idea to keep the cubbies for yourself:):) Miss you much:):) Squish!!! HI Karen! Your workshop is so amazing. I love all the darlings so well organized. Everything looks so beautiful. Wish I had that kind of organization!! Enjoyed the tour, thanks so much. And thanks for hosting! I just tried to link mine in, does it show up immediately or take some time. Not sure if I did it correctly. There seems to be some kind of strange mix-up /mistake in My hooking up My specific blog post. I think I might try again to make it right. Karen ~ as always, your space is delightful! And thank you SO much for hosting this fabulous party ~ I know it is a lot of hard work on your part. I've known of WBC for a while but have never managed to make the rounds each year. 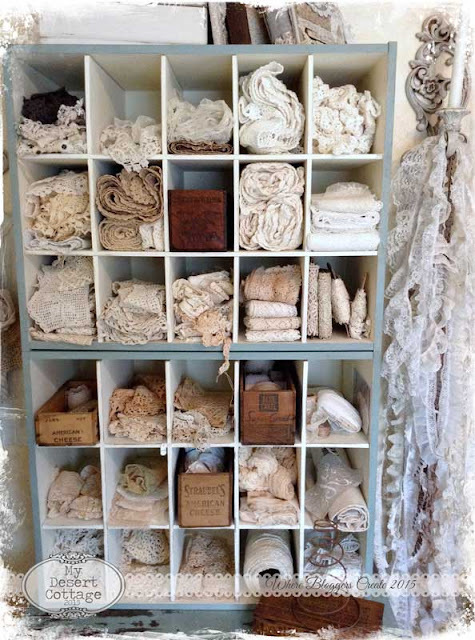 Your studio is simply swoon-worthy! I'm forcing myself to step away now so I can visit other places as well, but it's definitely taking a force of will. I could spend all day soaking up the wonderfulness. Karen you have a gorgeous studio! I love everything about it. The atmosphere you've created in there speaks volumes. 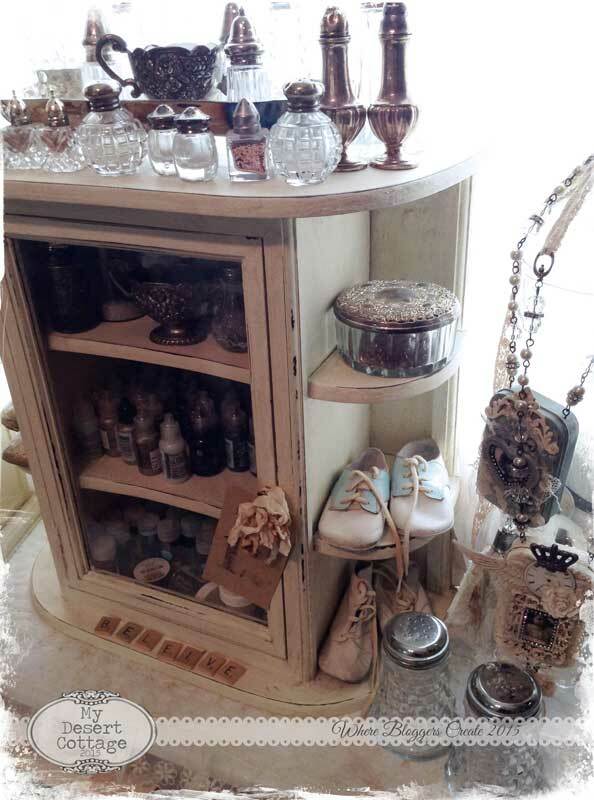 I love repurposing, reusing, revamping to make a useful item out of someones throwaway and you've done it so well! Thank you for sharing your very cool space with us Karen. I did a few posts on my studio last summer. Stop by sometime to see my little space. We'd love to see you!! Your studio is gorgeous! Thanks for hosting this link up. I linked up my new craft room. I set it up about a month ago, and I'm so happy to finally have a place to create and have me time. Karen, your party has been on my radar for SEVEN YEARS NOW! But I've never entered because I had been hosting a party myself at my blog for about five years and I never had the time to participate in yours. I would love to participate next year; I will keep posted for next year. Do you do it every July? I'll be visiting but my creative space gets created each time I do something and then gets put away..Pretty much the same as last year..I use my whole cottage...I had to give up my special room when I downsized several years ago..Thanks for hosting.. Thank you, Karen, for hosting again and for sharing your beautiful studio. I am doing some straightening up today and you have inspired me to tackle my long-neglected shoe pocket organizer. Things have been going in and nothing coming out for far too long! Love your studio! You are an inspiration so thank you for that and hosting this party. This is the first time joining even though I have followed you for awhile now. Thanks again! Hi, Karen! Your space is always so beautiful. I always have it and this wonderful annual hop in the back of my mind all year long. What wonderful group of creative bloggers this is. Such a supportive group, I can't help but have noting but enjoyment. What a great weekend. Thank you for hosting. Lovely tour - but oh it makes my fingers itch to do some crafting. Lovely! Lovely! as always! Shoe Caddies? are they wood? Will have to start looking for those! Beyond amazing . . .
Karen, your blog is always so inspiring and your space is wonderfully nostalgic with all the vintage and antique laces and finds. I am having a good time checking out the creative spaces of those who linked up to the party! I made it! I just finished visiting the last of the creative spaces. So many ideas ... so little time! I love your creative space, I can understand now why all your creations are so gorgeous! I have been visiting Where Bloggers Create since you started it, but have always been a cheerleader from the sidelines and have enjoyed every single site... but this year I jumped in and included not only my Craft room, but a new creative space that is in progress, a yarn/sewing room, even if I'm a little late. I can't wait to finish visiting every single beautiful, creative space!! I say that my spaces are ever evolving, and I know that I will find so much more inspiration that my spaces will definitely be changing again!! Thanks for hosting and inviting me to be a part of this!! I'd have a hard time leaving this room. So many beautiful things to see! Thanks for hosting this event again. It's so inspiring to see other peoples' creative environments! Thank you so much, Karen, for hosting this party each year. I so enjoy it and look forward to it every July. 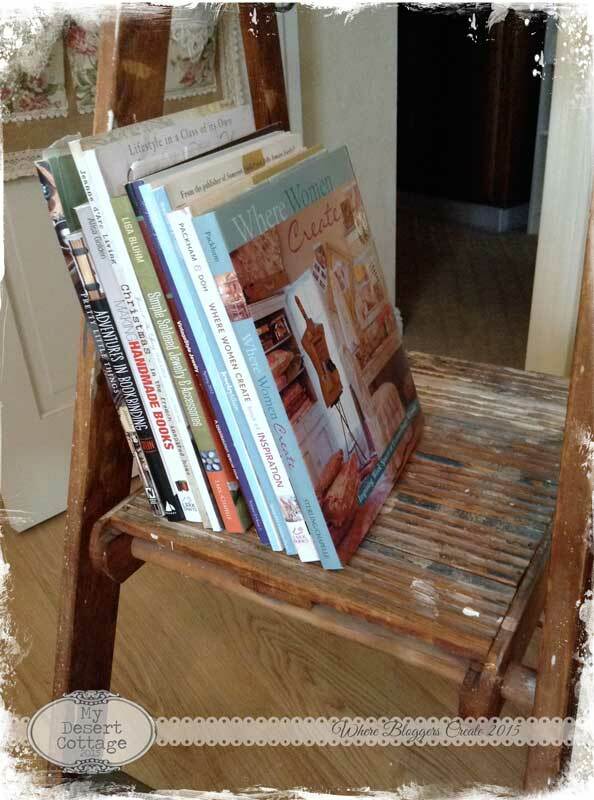 And, thanks for stopping by my blog and saying such wonderful things about my space. Although, it's nothing compared to yours. I just LOVE your studio. I could spend hours and hours in there. I just love everything about your room and would love to replicate it for myself, but I don't think that will ever happen. Thanks again for all the inspiration! Hello Karen! Thanks for hosting the party once again. 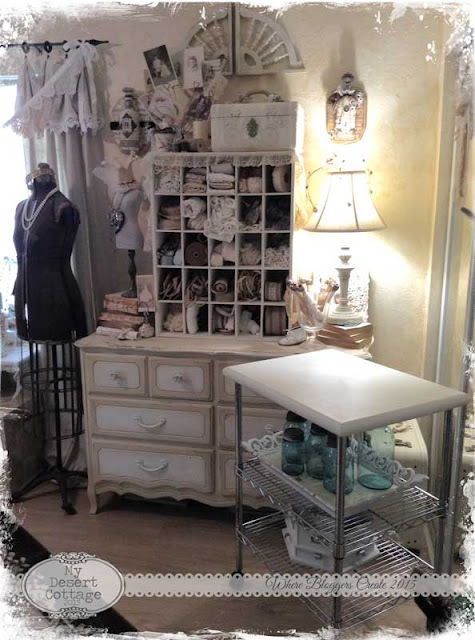 I love seeing your beautiful studio! I looked through this list of comments and didn't find my name so I guess I didn't leave a comment on your blog and studio tour. One of these days I'll get to take a little class at your home and then I'll get to see this lovely space in person. Hey, stranger things have happened. Especially in the Winter in Scottsdale. Hi, Karen! Your studio is really pretty! 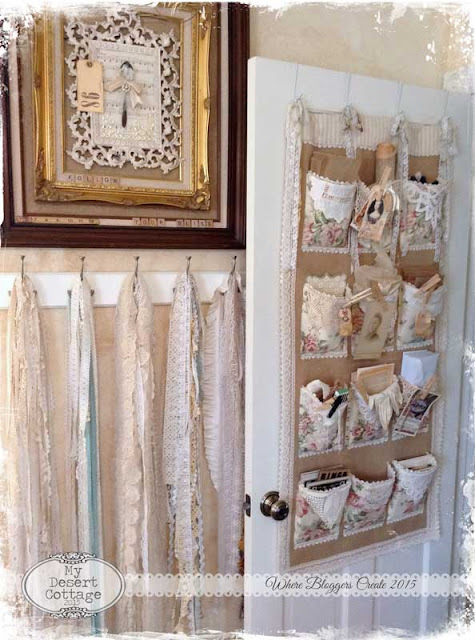 I like your decorations and lace and fabric collections. Thank you so much for hosting this party, and for your kind comment about my space. :) It's cool to see other people's creative spaces and I'm looking forward to next year! Karen, your studio is beautiful and always an inspiration. I love the duck egg blue! I've been trying to decide on just the right blue for a desk in my den. I think that is it! I may have commented on this post earlier. I took a quick look when the link up first began but could not spend the time I wanted to. I came back to take a closer look at your lovely room. So many great ideas for storage and pretty displays. 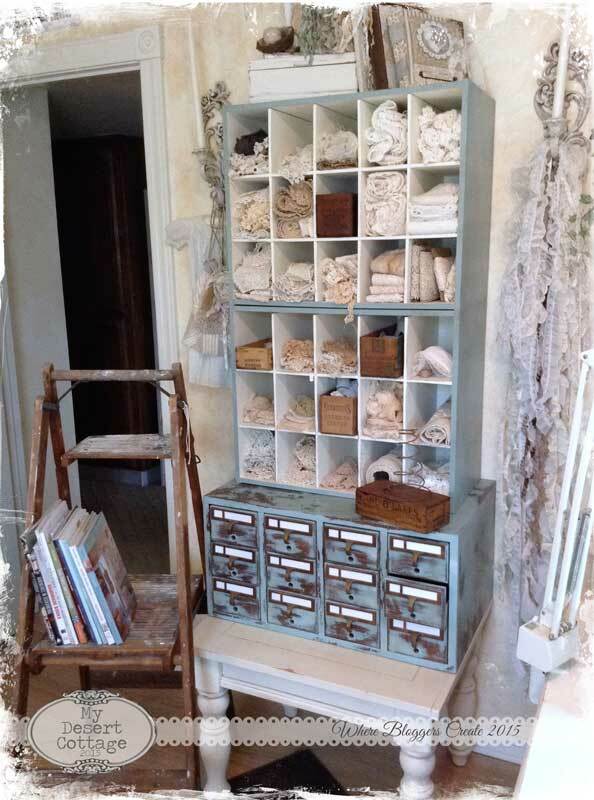 Hmm, I will have to think about painting my card catalog, I love the blue paint you used. I am slow to visiting all of the spaces but I want to look close and enjoy each one. Gorgeous as always. Love that you decided to keep the cabinet. Thanks for hosting this event. It is candy for my Magpie Eye and Soul. well done. Maybe next year I will get it together and join up again. In the mean time I will happily spend many hours perusing like minded crafters from around the globe.Keep smiling and creating. Wonderful! It's been a couple years since I participated, but I still enjoy the blog tour of all the wonderful studios. I would love to participate! Thanks!